How did you transition from General Duties to Highway Patrol? It’s mandatory to do a minimum of three years in general duties before you can transfer to a specialist position. I successfully applied for a traineeship at Cobar and have just completed the necessary 5 phases of training including Advanced Driver Training skills, Traffic legislation, Radar Theory and Maths as well as Lidar Theory. What are the main differences between General Duties and Highway Patrol? In my opinion, General Duties police are the real Police and respond to incidents reported by the general public (whether they be victims or passers-by). These incidents include domestics, break and enters, neighbour disputes, alcohol-related incidents at licensed premises, street offences, deceased, fires, and concerns for welfare. Highway Patrol is almost 100% pro-active with its main focus being reduction of road trauma and the free-flowing movement of traffic. However, when an incident is pressing (for example a break and enter is occuring) HWP will definitely respond if in the vicinity. Detection of offences against road transport legislation, high visibility patrols, random breath and drug testing, enforcing safety standards for light and heavy vehicles (e.g. tyres, lights, brakes etc) and heavy vehicle fatigue-related offences are the main ones. What do you most enjoy about your new job? You’re basically working to your own schedule. You’re tasked to different areas each day but within those taskings there’s a lot of autonomy. What do you miss about general duties? That’s easy. 12- hour shifts affording the 4 days on and 6 days off roster. Being a slave to police radio and having to respond to everything that comes up. How do most interactions with the general public play out? More people are pulled over for a random breath test than for speeding so the majority of people don’t have a problem. I won’t pull someone over for speeding unless I’m sure that they’re aware that they’re speeding. That way, no one really arcs up or pretends that they had no idea that they were breaking the law. Also, I don’t lecture someone about speeding if I’m going to issue them a ticket. The ticket itself is enough punishment and you still need to be friendly and treat people with respect. On the other hand, if I’m issuing a caution, they can expect a stern warning about the consequences of speeding – both in dollars and demerit points. South Australians are still on the old system of blowing into a tube but in NSW we’ve swapped to a “passive test” where drivers are simply required to speak (e.g. count to ten) into an alcometer. Often, when South Australian drivers are asked to count to 10, they’ll do it silently, expecting that you’ll breath test them after the 10 seconds. Then I need to explain that they have to count out loud. It was quite perplexing at first. What’s something that the general public may not know about highway patrolmen or what’s a common misconception? Most people may not know that we like to turn up the radio and sing loudly and tunelessly as we’re driving….. and of course, there’s the old misconception about a quota system – ‘four a day keeps the Sergeant away’ but seriously, police have original authority and discretion under the law so no one can tell us how many tickets to issue. Still, you’re there to do a job and save lives and getting people to slow down and drive responsibly is a large part of that. People also assume that, because we can, we constantly drive around at speeds above the limit. In my case, this is simply not true. If the speed limit is 110 kph, I’ll be driving at around 108 kph. If I’m enforcing the speed limit, it’s important that I’m doing that limit or just under. Of course, at times we do have to drive fast but not all the time. What are the main technical components of a highway patrol car and their uses? In every HWP car, as well as general duties cars, there’s a mobile data terminal (MDT) which allows police to access any information in relation to licence and registration status and criminal history and so basically anything we can access at the police station, we can also access in the car. All Highway patrol cars are also equipped with ANPR (Automatic Number Plate Recognition), which scans and recognises up to 6 number plates per second and picks up unregistered vehicles. As well as MDT and ANPR, all Highway Patrol cars have in-car audio and video, which starts recording as soon as the red and blue flashing lights are activated. This is legislated and therefore mandatory. Working in country areas, I imagine that you regularly encounter high speed situations. Is that true? Actually, it’s quite rare and in most instances speeding offences aren’t excessive. Do you often encounter irate drivers? Hardly ever. People are usually aware that they were speeding and most will ‘cop it on the chin’. It’s an endeavour to change driver behaviour through the hip pocket. Unfortunately telling someone that they’ve been bad and not to do it again doesn’t always work. What are the different makes and models of HWP cars? At the moment we have Commodore SS V8s, Ford XR6 turbos and the newer BMW 530d plus around a dozen Landcruisers across the state. We’ll soon be getting the Chrysler 300 SRT HEMI V8. Do you have a favourite make and model yet? I’m currently driving a Ford XR6 Turbo on loan to us from Nyngan and our car at Cobar is an SS but who wouldn’t like to cruise around in a BMW all day? 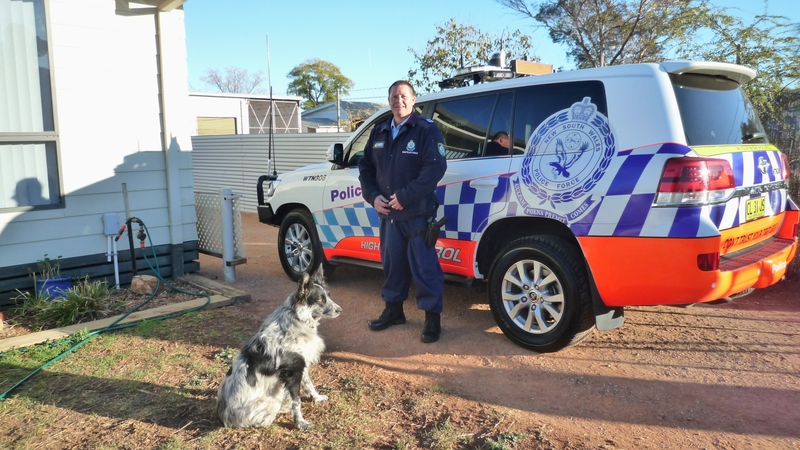 Thanks for your time, Senior Constable Chambers. And for the car enthusiasts……………………. The BMWs are powered by a 3.0-litre turbo-charged six- cylinder diesel engine that generates 195 kW and 620 Nm – enough to produce a 5.7sec zero-100km/h sprint while the 300 SRT, on the other hand, makes use of a 6.4 litre HEMI V8 that fires 350 kW and 637 Nm to the rear tyres producing a Commodore SS- besting zero-to-100km/h sprint of around 4.5 seconds.